This morning Sarah was our guide. She took us (myself and Traveler's Two through Four) our to Hoxa Head on South Ronaldsay. 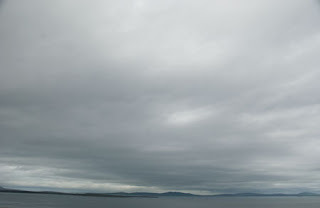 The coastal path at Hoxa Head gives good views of the islands of Flotta and Hoy. Hoxa Head is also notable for the WWI and WWII batteries that line the cliffs here. The major installations were constructed during WWII to defend the British fleet anchored in Scapa Flow from German U Boat attacks. Today only the concrete shells of the various installations survive but at one time two 12 pounder guns, two 6 inch guns and several coast artillery search lights were located here. 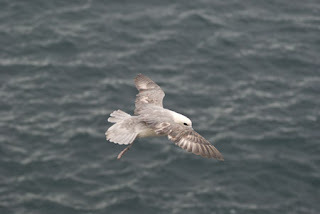 We saw black guillemots floating on the waves off the coast as well as one lonely seal swimming by. 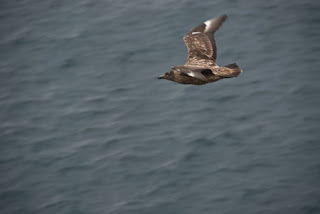 Bonxies (Great Skua) and Artic Skua were patrolling the cliffs. 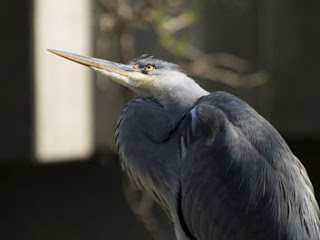 I am starting to love these snarky looking birds. 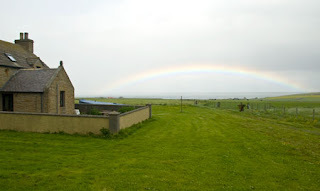 After lunch at the farm, we headed to the Liddel Farm on the southeastern tip of South Ronaldsay to the Tomb of the Eagles. The tomb is also called the Isbister Chambered Cairn and dates to 3000 BC. It was in use for about 100 years. The cairn was discovered and excavated by local farmer Ronald Simison. At least 16,000 bones were found in the chamber belonging to at least 342 individuals. A large number of animal bones were also found in or near the cairn, most significantly the remains of at least eight White-tailed sea eagles, from which the cairn gets its popular name. The skeletal remains of the individuals found in the tomb help us understand what local Orcadians looked like 5000 years ago as well as let us know what life was like for people in this particular community. Interestingly, the tomb entrance is aligned with the sun during two periods of the year, early spring and late summer. The entrance to the cairn seems to face a natural amphitheatre formed by a depression in the sandstone on top of the cliff on which the cairn sits. One of the highlights of a visit to the tomb is its location on a dramatic cliff walk. It's about a mile from the visitor center to the cairn. Another highlight is the choice of crawling on your hands and knees or pulling yourself along on a cart to enter the tomb through its 3 meter long entry way. The presentation at the visitor center is not to be missed. I liked it because, as an archaeologist myself, I got to put my hands on one of the actual skulls excavated from the tomb. There is also a Bronze Age site, the Burnt Mound, located halfway between the visitors center and the Tomb of the Eagles. This too was discovered by Ronald Simison. There are a large number of "Burnt Mounds" all over the islands, always near a fresh water source. These mounds are associated with the use of heated stones to boil water. 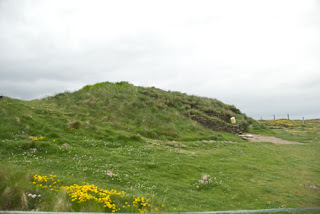 The first of these mounds dates to about 1200BC. The “house” at Liddel is typical of the structures associated with burnt mounds. The "house" has a flagstone floor with a large hearth and huge flagstone water trough. There are stone slabs set into the walls forming seats rather than beds. The central stone tanks were filled with water, then heated using red hot stones from the nearby hearth. Since the stones would char, become brittle, and crack they were discarded after use. They were thrown onto a pile forming the 'burnt mound'. The most common interpretation of this site is that it was used for the cooking of large joints of meat for communal feasting. But this is one interpretation. 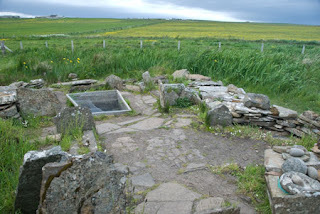 Both Traveler Two and I took one look at the layout and said, “Sauna.” According to The Orkney Guidebook there are those who agree with our assessment that the burnt mound structure may have been a Bronze Age bathhouse. Most human societies have well established cleanliness and purification rules (minus the rather egregious beliefs in Western Europe during the Middle ages through the Baroque period were bathing was shunned). And steaming oneself has been a very long extant tradition in Northern Europe (as in many places). But, as with most archaeological theories none of this will be proved beyond a doubt and, in fact, in this case, not enough excavation has been done in that particular area. It is a real shame that there’s not enough funding to do a large scale dig here. Until more is uncovered, no one can make any sure claims about the use to which the Burnt Mound was put. In the evening, back at the farm, we discovered Steve is a very good cook. 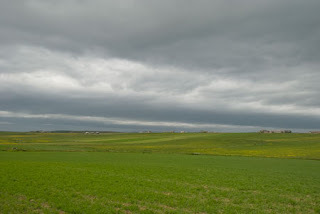 We also walked through farm fields out to the headland that is visible from the conservatory windows. I was so busy photographing local animals (cows and calves) that I did a typical photographer thing, being so intent on getting a shot, I fell in a ditch and startled my subjects. Little calves jumped in all directions. I now interrupt my regularly scheduled post to bring you the words of Orkney storyteller David Campbell (as printed in the CD booklet for the Wrigley Sisters brilliant album "Skyran). 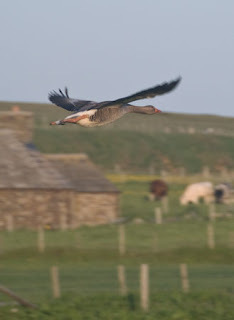 I include this because I wish I had written it and it sums up a lot of what I'm feeling about Orkney. an trappit them in time. no mortal e'e had seen. yon earthly flol o yourn. Wi trowie music in their strings. And it's trowie jewels you hear.